Treat yourself to a glass of wine and light refreshments. 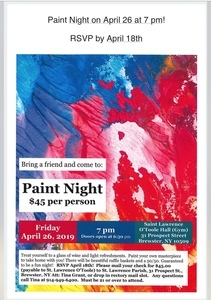 Paint your own masterpiece to take home with you! There will be beautiful raffle baskets and a 50/50. Guaranteed to be a fun night! RSVP April 18th!